I am Griet Steel, assistant professor at Utrecht University (department of human geography and planning) and as research coordinator of LANDac, the Netherlands Land Academy, I have led a year long action research programme on Women’s Land Rights in Africa. With this webinar we want reflect on some of the key lessons and messages of the programme and look how we can strengthen women’s land right in Africa but also in other continents and countries across the globe. We therefore would like to welcome four panelists from different civil society organizations and grassroots movements. On the basis of their day to day work in the field, they will reflect on how they fight for women’s improved access to and control over land and other natural resources and to scale up women’s land rights. Nzira Razão Deus. Nzira is the executive director from Fórum Mulher in Mozambique a civil society organization that for years has been working on gender equality and rural rights in rural communities across Mozambique. 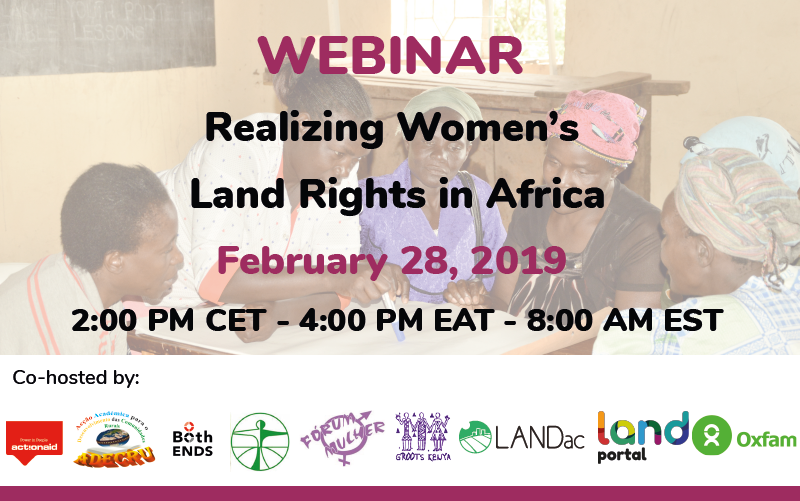 For the Women Land Rights programme they have teamed-up with ADECRU another oc-organizer of this webinar. As a human rights activist and member of the feminist movement, Nzira has advocated for the human rights of women and girls regarding violence, the economy, political participation, and sexual and reproductive health. El Hadji Faye programme coordinator of Enda Pronat, Senegal a civil society organization experimenting with agro-ecological alternatives that reduce the use of pesticide and strengthen the position of rural families. As the project manager of Enda Pronat Elhadji has worked around questions on tenure security, agricultural politics and agro-ecology in general. His day to day work is in French and Wolof so this is why we would like to also welcome his colleague Marina who will help out with translation in English in case needed. Fridah Githuku is the Executive Director of GROOTS Kenya. GROOTS Kenya is a network of Women-Led community organizations in Kenya. It formed as a response to inadequate visibility of grassroots women in development and decision-making forums that directly impact them and their communities. Fridah works with with grassroots women and girls in 17 counties and started programmes that have seen many women become successful lead farmers, landowners and leaders at the grassroots, including members of land boards. Sreetama Gupta Bhaya from works with Oxfam India. She has 16 years of experience on issues of governance of natural resource, rights & livelihood -primarily with tribal communities in India . She has worked with national and international NGOs, with Government of India, on policy & advocacy related to tribal rights and livelihood. . She will speak on women rights in the context of natural resources and the advocates for the importance of collective rights and how these enable a space for women to negotiate. In the next hour these four panelists will be asked one by one to look at the bottlenecks of women’s land rights and why it remains an important issue to focus on, as well as questions on their experiences and good practices to improve the situation on the ground and what will be further needed to scale up these approaches. After the first hour we will open the discussion and give room to the participants to add questions. Please use the questions feature to pose questions to the panelists. We will ensure that your questions are addressed in turn during the open discussion that follows. Why women's land rights is an issue? Let begin this conversation with a question for El Hadji Faye. El Hadji - could you please share your thoughts on why women’s land rights is an issue with so much attention focused on it? First of all, there is a lack of consensus on the issue of women’s access to land. Still today, some people believe it is a false problem and, worse even, that it corresponds to westernized ideas that seek to disturb our ways of life and wreak havoc. What is more, the problem is often taken in isolation, without any link to the global issue relating to the perception of women in society. According to this perception, women are immature beings, incapable of taking control of their own destiny and therefore should always be under the responsibility of a man, be it her father, her husband, or even her son, and dependent on a man for accessing resources (inputs, means of production, etc). Without those resources land cannot serve as a vector of economic empowerment. Another problem relates to the belief that the issue of women’s land rights is simply a rights-based problem. This is a problem that has to do with practices, the law in of itself does not solve the problem. Why women's land rights is an issue focusing so much attention? Nzira, why do you think women’s land rights remain an issue with so much attention focusing on it? First let me indicate the context. Today, 80 % of food are produced by women in Mozambique but only 15% own the land. Legally, however, women should have equal access to land as men. The problem is asymmetric power relation between men and women, alongside social dynamics in a society characterized by patriarchal practices. Customary land governance systems often only allow women secondary rights and access to land through a male relative. Moreover, very few women hold land titles in their own names. And women are rarely allowed to take part in decision-making processes. This is compounded by land conflicts between investors and communities (in which women are the majority) happen because of the corruption from the politicians that should be implementing the laws defending the communities. Decision makers are receiving capital from the private sector or are also involved also in `land business` and do take into consideration poor people and communities. Finally, there is a lack of commitment from the government to implement the legislation and make sure that small farmers have their rights ensured. Why is it necessary to focus so much attention? Fridah, what is your take on this? Why is it necessary to focus so much attention on women’s land rights? Why is it an important issue to be addressed? Thank you Fridah for that important perspective. Sreetama, can you share your thoughts on why women’s land rights remains an important issue to be addressed? Women frequently have de facto or land-use rights as compared to men’s de jure or ownership rights. Women often have use rights that are mediated by their relationships with men. The rural agricultural sector is the biggest employer in India. The data show that almost 70% of the farmers in India are women. Of the 70% engaged in farming, only 14% have rights to land. Despite their dominance in the agricultural labor force, women in India continue to face extreme disadvantage in terms of pay, land rights and their representation in agricultural decision-making continue to be poor. With the fragmentation of land and increasing populations, it is becoming painfully obvious that land is a finite resource. Tiny pieces of land can only fulfill a small portion of the livelihood requirement. What we have also ignored is the common resources on which mostly the indigenous communities and women especially depend. Worldwide, 2.5 billion people rely on Indigenous and community lands – yet so far, much of the energy on women’s land, forest and water rights has focused on individual titles to households or agricultural land. How men and women use resources reflects gendered access. The depletion of common property resources poses a severe threat to the livelihoods and food security of poor rural women and men. Women household heads remain at a particular disadvantage in terms of access to land, water, and other natural resources. A key point is that gendered relations and responsibilities in terms of natural resources are dynamic and subject to change. Significant differences between the roles and rights of women and men in many societies lead to increased vulnerability of women with the deterioration of natural resources. In some instances, deterioration of natural resources results in the renegotiation of gender roles. Livelihoods of people living close to forests and within them are inextricably linked to the forest ecosystem (MFP). (For example, in the state of Odisha, forest loss in just 5 years almost doubled the distance people (typically women or girls) had to travel to collect a shoulder load of firewood – from 4km in 1995 to 7.3km in 2000. More than 200 million people are dependent on forests for their livelihood (India, State of Forest Report ,2009), including for food, fuel wood , forest produce, essentially a forest-based economy. The majority of forest dwellers depend on forests for up to 50 percent of their food requirements. This raises the question: How can we safeguard women’s land, water and forest rights across all tenure systems? Thank you Sreetama. Let me now move on to the second question. El Hadji, what are some good practices you have seen in achieving success towards women’s land rights and what – according to your own perspective – made these initiatives and strategies successful? We should not focus only on laws, but try to influence practices and perceptions of grassroot actors by involving those who hold power at the local level (customary chiefs, religious authorities, mayors, local representatives, leaders of local civil society organizations…). We should also try to influence national public opinion on the issues relating to women’s right in general and, especially, land rights. Another effort that should be made is to take incentive measures to support women with production, but subsidizing inputs, and other methods. Moreover, we need to reinforce the intellectual and political capacities of women. What make initiative and strategies successful? Thank you El Hadji. Nzira, what is your perspective on good practices in achieving success towards women’s land rights and what – according to your own perspective – made these initiatives and strategies successful? We should build collective actions and a social movement in which women can understand the roots of the problem, and discuss the strategies on interventions and engage actively in political dialogue (like, family law, land law, inheritance law) with decision makers to defend their rights and demand programs that challenge nocive social and cultural practices. Access to information, local knowledge and data from the grassroots is crucial to understanding the complexities of women’s land rights on the ground, to designing tailored interventions and to advocating for women’s access to land and natural resources at local, national and international levels. It also provides a space for the cross-fertilisation between knowledge and action. We should also organize community workshops to generate data about the communities and offered clear insights into the priorities of women when it comes to land issues. This local information is crucial, as it makes the priorities of the communities visible and provides them with the necessarily insights to stimulate action on the ground and influences policymakers and other authorities. Documentation and Advocacy is also another important element of this work. We need to make women’s voices and stories more visible through community meetings and the use of videos to document their experiences and concerns. This stimulates community cohesion and collective action on the ground. Finally, we need to raise awareness in local communities about women and men’s rights to land even under customary law without formal DUATS. Activities by local partners show that space for this is needed and what works in practice, such as storytelling, poetry and documentaries. Thank you Nzira, Fridah what is your perspective on good practices in achieving success towards women’s land rights and what – according to your own perspective – made these initiatives and strategies successful? Social movements/collective action is critical. A vibrant women rights’ movement in Kenya was able to lobby for policy and legal amendments (2010 Constitution, marriage act, matrimonial property act) guaranteeing women and girls regardless of their social status legal right to land and property, and protection against discriminatory cultural laws. We also need grassroots Women Land Rights Champions. They have provided leadership to non-sensitized communities and in many instances supported women right holders in such communities to assert their rights in a rather hostile environment. They earn credit on many successful case stories of guiding women to step up in claiming their land rights across the countries, through proactive justice and/or redress (formal or informal). In the next question a suggest how we can complement the work of grassroots champions with public service champions for large impact. Participatory social tenure models of documenting land rights-They provide an effective alternative to the poor formal system of recognizing people’s rights. The social models have demonstrated how countries can go about documenting land rights of all persons, guaranteeing both legal and social protection to all and promoting collective responsibility. i.e the Participatory Land Mapping model by GROOTS Kenya,the social tenure domain model by GLTN. Any other comment on good practices? Thank you Fridah. Sreetama, we’d like to hear from you. What have you seen are good practices in achieving success towards women’s land rights in India and what made these initiatives and strategies successful? Livelihoods of people living close to forests and within them are inextricably linked to the forest ecosystem (MFP). In India, Oxfam has found that collective rights under the Forest Rights Act, 2006 are an important tool for women. Collective decision-making can create a more level playing field, and does not immediately threaten household harmony by pitting men against women. Women from tribal (Adivasi) communities are often at the forefront of grassroots struggles for community control and decision-making over forests. Women’s responsibilities for feeding their family and caring for vulnerable members give them intimate knowledge of local ecosystems and the impacts of their loss. Linking forest rights with gender justice campaigns could help further women’s leadership and confront gender-based violence and the power inequalities that contribute to it. Given the vital role women play in protecting forests, this would also promise better outcomes for not only women but also men. Finally, collective decision making in collective spaces empowers women much more as she derives strength from the collectives and in the longer run penetrates in the family level decision making. Thank you Sreetama. Now let us turn to what is needed next to scale up these approaches and to move the women’s land rights agenda forward and what your message is to policy makers. El Hadji, what are your thoughts? We need to capitalize on good practices and approaches to projects, civil society and state programs. In order to be successful, we should scale up these initiatives through public policies and financial partners. My message to policy makers is that they need to Integrate the gender agenda in public policies and programs. They need to integrate gender and women’s right in training curricula, especially for public officials intervening in rural areas and in the field of agricultural services and in school programs. Moreover, it is also the responsibility of the policy makers themselves to raise awareness of financial partners (bilateral and multilateral) on the necessity to scale up achievements and successful initiatives. What is your message to policy makers? Thank you El Hadji. Nzira, What do you think is needed next to scale up these approaches and to move the women’s land rights agenda forward, and what is your message to policy makers? First of all, to scale up work on women’s land rights we need to train women to be politically engaged on legislation reform dialogue, so she can defend herself and her lands with her own words. Next, we need to strengthen the women’s social movement to come together and participate actively on local dialogue and build solidarity between each other, like Kilimanjaro campaign. Moreover, we need to design tools for women monitor the allocation of the land and understand the agreements signed by government, and also strengthen women's leadership as well as engage local authorities on the training. My message to policy makers is that they need to ensure transparency in land governance and administration for the full participation of all citizens in the process of formulating inclusive policies and programs that respond to the demands of women. Rural women small farmers must have a seat at the table during discussions for revision of legislative law. They must be heard and her contributions must be taken into consideration. Access and Dissemination of information is also very important.The National Land Registry must be made available to the public through small booklets and an online platform. We need access to statistics and data, such as the number of land title in the country, discrimination by province, district and even Administrative Post. Individual and collective owners of these land title should not constitute a State secret and in no way does this information call into question the National Interest. Importantly, they need to ensure the implementation of the land law that recognize the equal rights for men and women, as well as community rights. Finally, they must ensure equal opportunity to access the funds and investment on land and provide legal assistance for small farmers in case of land conflicts with private investors. What is needed to scale up the women's land rights agenda? Thank you Nzira. Fridah, What do you think is needed next to scale up these approaches and to move the women’s land rights agenda forward,and what is your message to policy makers? How can policy makers support these efforts? They can bring women’s land rights to the mainstream of land reforms, carry out an effective problem analysis, plan and budget for programmes that address the gender inequalities in the sector i.e abolish a land tilling programme that confer absolute land ownership to men in total disregard of the interest and rights that women may have over the same land as mothers,wives,siblings or daughters. They must provide legal protection and support to small scale land holders (Majority of women are users of small land holdings) to minimise the threats posed by are large scale investors be it government,foreign or local investors. Policy makers must also reform the land institutions and inject to the land sector, new, progressive staff and feminist leadership . The land sector is overcrowded with patriarchy all the way to the devolved levels. This anti- gender equality attitude has contributed significantly to the policy -practice gap. Human resource forms part of the mean of implementation. The few progressive staff are outnumbered by those who want to retain the status quo, as far as gender reforms are concerned, and may be able to effect internal change in the current composition. Other approaches to move the women's land rights agenda forward? Thank you Fridah. Sreetama, What do you think is needed next to scale up these approaches and to move the women’s land rights agenda forward,and what is your message to policymakers? It is the Government which has the responsibility of scaling up successful models though programmes and budgetary allocation. As civil society and implementing organisations we need demonstrate successful model and undertake evidence based advocacy for its adoption. For civil society and women’s movement groups, the women’s land right should incorporate their rights over common resources such as forest, ,water , pasture land -across all tenure systems and all resources. My message to policy makers is that agricultural land records should be digitized and updated with gender disaggregated data. (Both government regularised and privately held). They need to count landless women farmers as part of the agricultural census. Access to financial support to be made available to small and marginal women farmers for land development activities, improving soil and moisture, etc. They should provide budget allocations for women farmers, and opportunities for decision making on indigenous / biodiverse crops such as millets and support for maintaining grain banks, seed banks and primary processing. Women friendly technology should be made available to women farmers to reduce drudgery and capacity building through land and legal literacy for the women farmers. Women personnel must be recruited at all levels in the Agriculture and Extension Services Departments. With regard to the commons, a comprehensive policy for decentralised forest governance system with women playing central role in village council must be integrated into policy and practice. More and more land is being diverted and the poor are facing evictions and displacement, as land is being taken up for commercial plantations which again affects women much more. While men opt for monetary compensation, women’s approach is more from a livelihood perspective. Therefore, the consent of women should be mandatory in case of displacement or eviction. In case of consent at village level, 50% must be women. In all project clearance processes for forest and environment, principles of free prior informed consent must be applied strongly especially in indigenous community’s area with focus on women. Finally, women should be part of any committees that mediates conflicts related to land and natural resources.